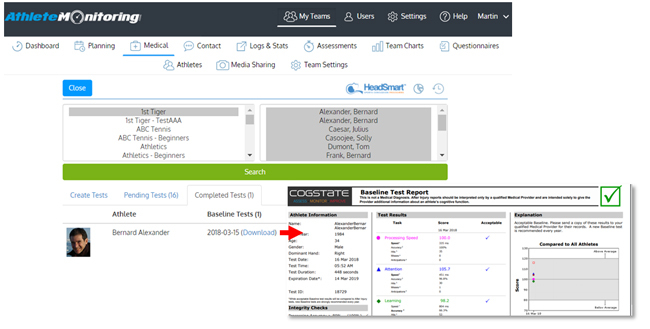 AthleteMonitoring.com and the HeadSmart™ Sports Concussion Programme have teamed up to simplify concussion screening and streamline athlete monitoring and data management. As one part of overall concussion management, this partnership allows sports medicine and healthcare professionals to send HeadSmart™ baseline screening tests to athletes, administer post-concussion assessments, and to securely centralize all concussion assessment reports from within the AthleteMonitoring AMS platform. “HeadSmart™’s vision to provide a front-end fit for sports concussion management from grassroots to professional sports, takes a significant step forward today. The HeadSmart™ – AthleteMonitoring integration will go a long way to addressing the challenges faced in providing all sports organisations, schools and clubs with effective concussion resources.” says Dr Ryan Kohler, Founder and Managing Director of the HeadSmart™ Sports Concussion Programme. The AthleteMonitoring – HeadSmart™ integration is now available to schools, clubs and sport organizations worldwide. Learn more about the Headsmart concussion test, see how the integration works, and contact us today to sign up or to request a free quote! Current HeadSmart™ clients can benefit of a special 20% introduction discount on any AthleteMonitoring.com subscription plan (offers expires on June 30).